Kia's first ever D-segment estate car, the Optima Sportswagon, is to join its UK line-up next month. Arriving in the UK at the same time as a plug-in hybrid version of the Optima, Kia is looking to expand its business, especially in company fleets. In Europe, where two-thirds of D-segment sales and 75 per cent of fleet sales in the class are taken by estate cars. The Optima Sportswagon was designed in Europe and will be sold only in Europe. Its exterior design remains faithful to the SPORTSPACE concept revealed at the 2015 Geneva Motor Show. It features integrated roof rails and offers a minimum of 552 litres of cargo space, including two underfloor trays, expanding to 1,686 litres with the rear seats folded. The roof rails make the Sportswagon 5mm taller than the saloon at 1,470mm but all other dimensions are the same. The front half is identical to the saloon as far back as the B-pillar. From there a rising shoulder line and more gently swept-back cabin with a raked rear window and tapering roof are said to give the Sportswagon an ‘elegant, sporty appearance’. The rear lamps wrap around the corners and there is a single exhaust outlet. Powered exclusively by a 1.7-litre turbodiesel engine, the Sportswagon is available with a full suite of advanced connectivity and active driver assistance technologies, including Android Auto, Apple CarPlay (available later in the production run), Kia Connected Services powered by TomTom®, a harman/kardon eight-speaker audio system, Autonomous Emergency Braking, Smart Cruise Control and Rear Cross Traffic Alert. 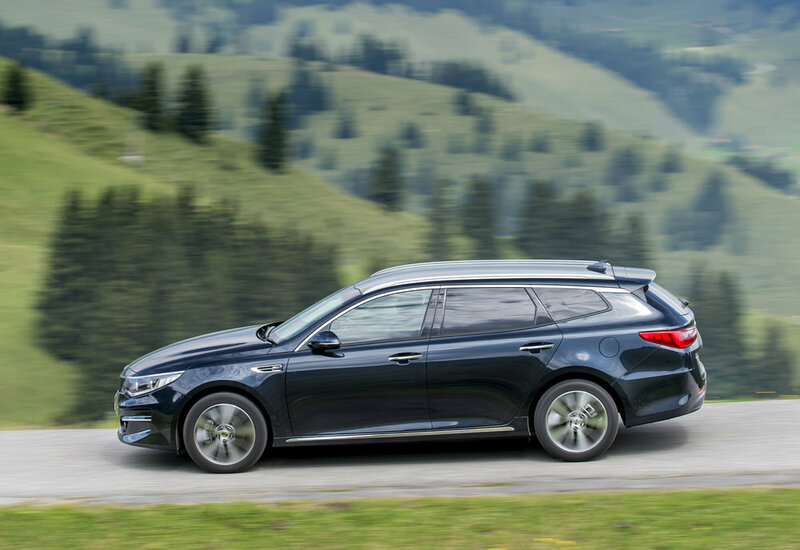 There are three trim lines for the new Optima Sportswagon – 2, 3 and GT-Line S – mirroring those available for the saloon but a fourth sporty high-performance GT version will be added early in 2017. The Sportswagon comes with Electronic Stability Control and Vehicle Stability Management as standard. These can automatically counteract any loss of traction when cornering or setting off on surfaces with differing levels of grip from left to right. Six airbags are also fitted as standard. With Kia's Idle Stop & Go (ISG) engine stop/start system as standard, CO2 emissions of manual models are 113g/km, 3g/km more than the saloon, while fuel economy is 64.2mpg. With the 7DCT dual-clutch automatic gearbox, which is available in grades 3 (optional) and GT-Line S (standard), emissions are 120g/km, while fuel economy is 61.4mpg. 0-60mph acceleration takes 9.8 seconds with the manual or 10.7 seconds with the 7DCT automatic, but the top speed with either transmission is 124mph. 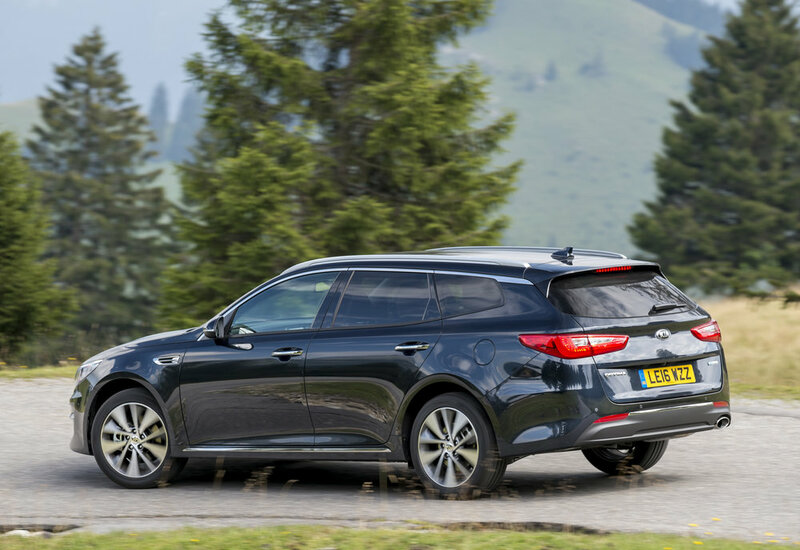 In keeping with every Kia, the Optima Sportswagon comes with the company’s fully transferable, unique-in-the-UK seven-year or 100,000-mile warranty, subject to certain wear and tear conditions. Priced from £22,295, the Kia Optima Sportswagon goes on sale from September 15.